Ninety-four students, faculty members, staff, partners, and alumni came out for another successful Women in Leadership panel discussion here at the College on April 16. We heard a lot of positive feedback from attendees. In fact, many said the Women in Leadership event is their favorite event of the year, and this year’s was the best one yet. We shot photos throughout the event of our panelists and audience members their views throughout the night, and wanted to share them with you. We also heard some tidbits of advice throughout the evening that we think every professional woman can benefit from, whether or not you were in attendance. As a woman, it's OK to ask for things at work in a professional manner. Whether it's a promotion, a raise, or more responsibility, it's up to you to speak up for yourself. Success is knowing what makes you happy and then being happy when you get it. Success isn't just about uncovering my potential -- it's about uncovering the potential of others. No one is perfect -- perfection is a façade. No matter how high up you get in the food chain, there will always be days where you feel something isn't getting accomplished, and that's OK. Take pride in your accomplishments each day. Find a personal and professional mentor. It should be someone that can give you some tough love when you need it, and will help you reach your potential. To find a great position, you have to volunteer, get exposure, and figure out if it's really what you want. It's also extremely important to network. Talk to professionals who are doing what you want to do and then connect. Manage your time by compartmentalizing your duties -- focus on work at work, and your family at home. And remember that you might need to change your strategy as your life and responsibilities change. But it's most important to figure out what you're not willing to step back on. Then ask for help to handle the rest. Make people remember your reaction to the negative. Always take the high road in business. Find it, make it, own it, do it! Remember, there's always an opportunity to raise your hand. This event is important because it gives real-world advice from women who have been there. Whether you're changing careers later in life, supporting your family while getting your education, or recreating your personal brand, chances are that one of the women on this panel shared some advice that relates to you. We also presented two leadership awards as part of the event. Congratulations to Jo-Ann Williams, a former Paralegal studies student, for winning the Alumni Leadership award, as well as Ashley Arntz, a Paralegal studies student who will be graduating this year, for winning the Student Leadership award. 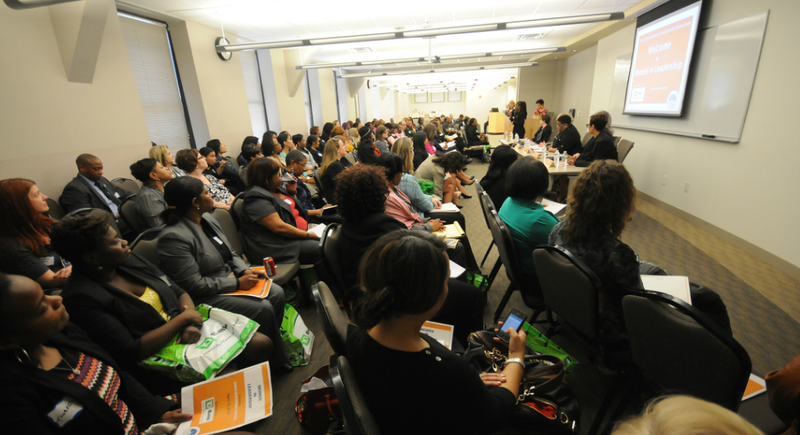 Thanks to everyone who came out and participated in our 2013 Women in Leadership event. It was a truly special evening, and we hope you took away some valuable advice about your career, family, and work-life balance.